As a building material, concrete cannot be matched, but as the world’s third highest source of man-made CO2, something has to change. This is where Cemfree comes in. 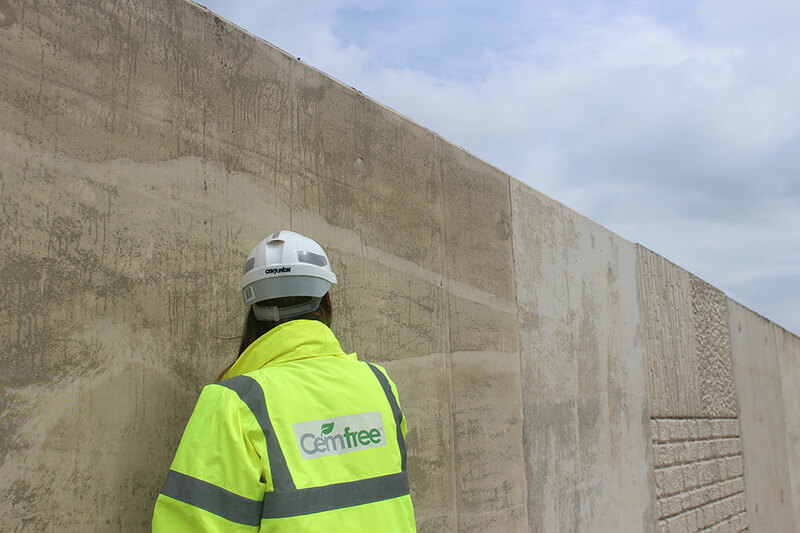 Cemfree ultra-low carbon concrete is a pioneering sustainable solution for today’s construction industry. Cemfree is a game-changer for concrete technology. It has significantly higher environmental credentials compared to the other ‘green’ concretes that are currently available. This innovative technology can achieve dramatic carbon savings on your project due to the complete removal of Ordinary Portland Cement (OPC). Cemfree uses existing production techniques, installation principles and delivery infrastructure, so the only real difference is a positive one – CO2 savings of up to 88% on your project. Concrete is the most used construction material in the world. Its incomparable compressive strength, versatility, thermal mass, low cost, and well-established supply chain and infrastructure make it an obvious first choice for contractors the world over. However, concrete does have its drawbacks. On a practical level, OPC-based concrete’s high heat of hydration limits pour sizes due to the risk of thermal cracking from the heat it generates. From an environmental standpoint, the production of one tonne of OPC – concrete’s key ingredient – causes the release of almost one tonne of CO2 into the atmosphere.